What is 5x7 dot matrix display? 5x7 dot matrix Led display is usually used to cascade together to make a large led matrix display as you see in train station. 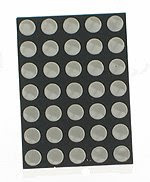 The small size of 5x7 dot matrix led display is good for small electronic project, typically the 5x7 dot matrix is used to display one character a time, i.e. 5x7 dot matrix font. In order to use only one 5x7 dot matrix to display information, we have to use the 5x7 dot matrix horizontally. We use the 5x4 dot matrix font instead and of course text scrolling will be necessary. 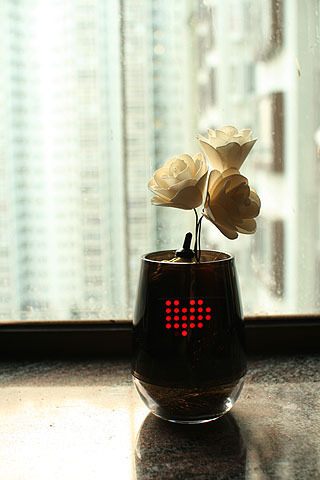 The KAAS Led flower vase is using the 5x7 dot matrix display for displaying messages. kaas used one AVR tiny13 and two 74hc595 chips to drive the led matrix, the result is very impressive. The detail information of the LED flower vase is here. Another project from us, GIF2LED! "Twitter LED scroller" is a 5x8 dot display, not 5x7 dot.